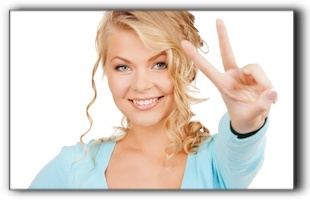 Mother Theresa once said “Peace begins with a smile.” Perhaps that peace should start with the person who is smiling. How do you feel about your smile? Are you at peace with it? Do you think it’s beautiful? Bright eyes and bright smiles are best served clear and clean. Regular check ups with The Plano Dentist can prevent decay and costly corrections. Stay at peace with your smile by seeing us twice a year. If you aren’t happy with the state of your smile, cosmetic dentistry has ways to improve it. Talk to us to learn how you can achieve a smile you can be at peace with. The Plano Dentist has years of experience transforming ordinary smiles into spectacular smiles. Porcelain veneers a thin shells of medical-grade ceramic that are attached to the front of your teeth. The effect is quite startling! Did you know that veneers have been used for nearly a century? Movie stars in the 1920s first used them to enhance their smiles. Teeth whitening is one of the most in-demand services we provide. It’s the kind of whitening you can’t get from a toothpaste tube. The Plano Dentist offers in-office whitening, and take-home kits. Dental implants are an ideal solution for anyone whose smile is marred by a missing tooth. A dental implant is a titanium post that is surgically attached to the patient’s jaw. An artificial tooth sits on top of the post. Once it’s in, the replacement is virtually indistinguishable from the real thing. The Plano Dentist believes that everyone deserves a beautiful smile. Call us today for an appointment.